Atlanta, GA, and San Jose, CA, November 26, 2018 – Republic National Distributing Company (RNDC), one of the nation’s largest wine and spirits wholesalers, and Liberation Distribution™ (LibDib™), the first technology company to offer a three-tier compliant distribution model for all Makers, today announced plans to form a strategic partnership. As a part of the agreement, LibDib Makers will soon be able to tap into RNDC’s advanced logistics to deliver craft products to buyers in all available markets. In return, RNDC will have access to LibDib’s technology and data collection, enabling the company to further expand their value and services. RNDC is currently the nation’s second largest wholesale alcoholic beverage distributor with operations in 22 states. LibDib provides distribution services to any licensed Maker and currently operates in California and New York. This partnership will allow both companies to quickly expand web-based three-tier distribution to additional states. Those specific markets will be identified and announced in the near future. The two companies are working closely together to rapidly integrate technologies and complete the expansion into new markets. Via the LibDib platform, licensed Makers from around the world will soon have access to markets via RNDC’s advanced logistics network. RNDC and LibDib will share data and technologies to provide both customers and suppliers with market access, modern selling tools, and the most unique and diverse portfolio in the country. “LibDib’s Silicon Valley engineering and data science team is best in class. We are very excited to work together and further evolve both of our businesses,” added RNDC’s Tom Cole. LibDib is the only licensed distributor with a technology platform that allows for licensed three-tier distribution for any licensed Maker, one case at a time. Since launching in March 2017, the company has significantly expanded its online offerings, and its technology platform offers ease of use, advanced selling features, and invaluable back-end data collection capabilities. RNDC is the second largest distributor of premium wine and spirits in the United States with operations in Alabama, Arizona, Colorado, District of Columbia, Florida, Indiana, Kentucky, Louisiana, Maryland, Michigan, Mississippi, Nebraska, North Carolina, North Dakota, Ohio, Oklahoma, South Carolina, South Dakota, Texas, Virginia and West Virginia. RNDC employs more than 9500 individuals nationwide. For more information about the company, please visit www.rndc-usa.com. Liberation Distribution, Inc. (LibDib) is a distributor of alcoholic beverages enabled through a proprietary desktop and mobile-friendly web platform. 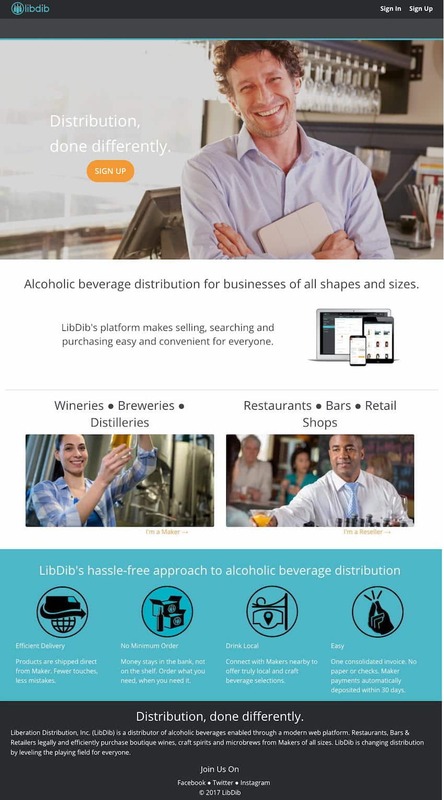 LibDib focuses on the evolution of alcoholic distribution utilizing modern technology to provide three-tier compliant services for everyone regardless of size. Using LibDib, restaurants, bars and retailers legally and efficiently purchase boutique wines, craft spirits and microbrews. The company was founded in 2016, launched in March 2017, and is based in San Jose, California. LibDib can be found online at www.LibDib.com as well as on Twitter, Facebook, Instagram, YouTube and LinkedIn.